Unsurprisingly, it all started with a wedding. Before Dawson Clark knew he wanted to build one of North Austin's go-to wedding destinations in HighPointe Estate - before he even knew that the wedding and event industry was his true calling - he was just another father trying to figure out his role in their son's wedding. “I've been a floral hobbyist most of my adult life,” Clark says, as he reflects on his early days as a wedding entrepreneur. While the families discussed the logistics of the ceremony, Clark landed on a unique way of contributing. “When our son and now daughter-in-law were getting married, I said to them, 'I'm relatively confident I could figure out how to to do the flowers if you trust me to do it.' My daughter-in-law said, 'I trust you." The flowers created by Clark and company - his wife Leanne, daughter Amy, and a host of friends - were a hit, and it wasn't long before Clark’s keen eye for color and design caught the attention of several friends and family members who had their own weddings on the horizon. Soon, Clark found himself running a part-time floral service out of his kitchen. Over the next several years, Clark and his family would travel across Central Texas to provide floral arrangements to more than a dozen weddings. It was during one of these trips that he realized he was no longer satisfied with weddings being a part-time opportunity. He did. In 2016, Clark left his senior position in a local non-profit and embarked on a multi-year mission to build the perfect wedding venue. In designing the two buildings at HighPointe Estate - including the vintage East Austin Bungalow he relocated to serve as a smaller venue and reception area - Clark drew on his years of experience in the wedding industry to identify and solve for pain points he'd identified as a vendor. The first was the need for an indoor ceremony space to serve as a backup for outdoor weddings. “There are only two or three venues in all of the Austin Metro area that offer the space and the configuration that we will offer,” Clark explains, noting that the primary event space and chapel will seat up to 300 people. This provides families with a much-needed “Plan B” option in case the weather turns foul, a backup plan not available at many other locations. And by choosing a location in Williamson County, Clark was able to serve a community who often has to travel an hour south to find a facility that meets their needs. And while construction on the new venue is only just beginning, the smaller venue is open for business - and already making memories. On April 6, HighPointe Estate hosted its first wedding, and the guests couldn't have been more appropriate. “The fact that our first wedding was my brother, and all of my family was here for that first wedding, it's really special,” Clark says with a smile. Here's to many, many more weddings in the years to come. 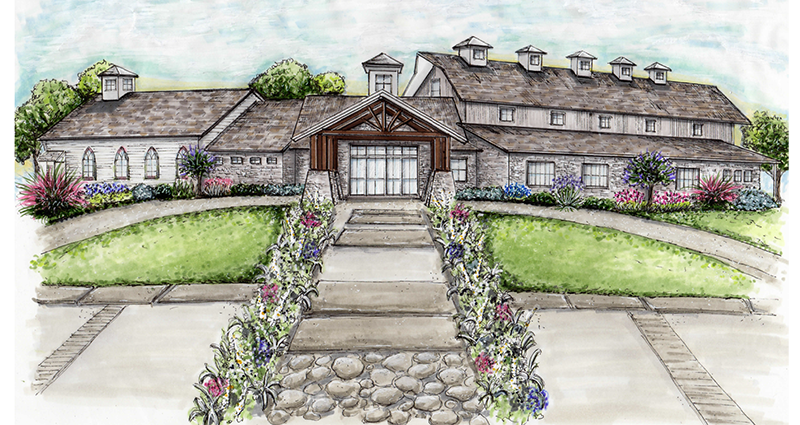 Artist's rendering of the beautiful new HighPointe Estate event center and chapel.